John Corcoran is one hell of a networker. He’s worked at the White House, written for the Huffington Post, and built a booming law practice. At the root of all his successes is his incomparable talent for making powerful connections. In his latest venture, Smart Business Revolution, John brings his sharpest relationship hacks to light, helping others turn their personal networks and businesses into mighty enterprises. Today he shares those secrets with us. Your conversations list (and how to build it). What it really means to be of service to other people. Turning your “help” into revenue. Leaving smaller opportunities behind to make a larger impact. How to make podcasting effective in an oversaturated market. 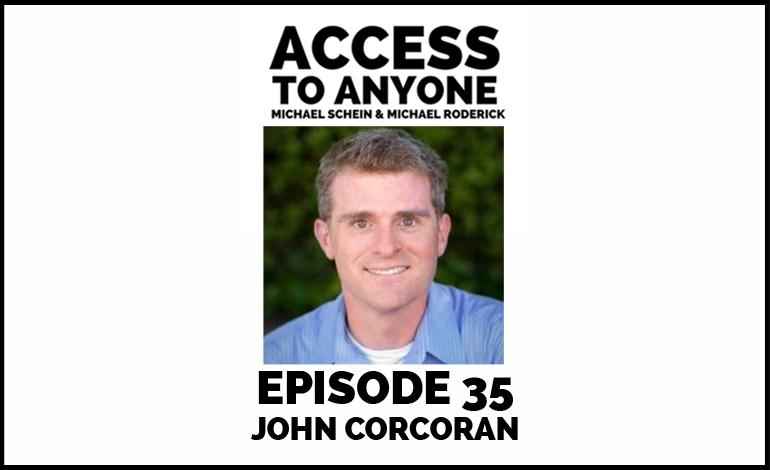 John Corcoran started his career working in politics, including as a Writer in the Clinton White House. Later, he returned to California as a Speechwriter in the California Governor’s Office during the Davis Administration. Today he runs a boutique law firm, through which he helps small business owners and entrepreneurs grow and resolve disputes, as well as SmartBusinessRevolution.com and related podcast through which he shows business owners and entrepreneurs how to use relationships to attract more clients, customers and revenues. His writing has appeared in Forbes, Lifehacker, The Huffington Post, Business Insider, Art of Manliness, Boost Blog Traffic, and Dumb Little Man.